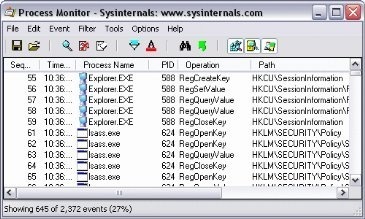 Microsoft Process Monitor is an advanced monitoring tool for Windows that shows real-time file system, Registry and process/thread activity. Microsoft Process Monitor combines the features of two legacy Sysinternals utilities, Filemon and Regmon, and adds an extensive list of enhancements including rich and non-destructive filtering, comprehensive event properties such session IDs and user names, reliable process information, full thread stacks with integrated symbol support for each operation, simultaneous logging to a file, and much more. Microsoft Process Monitor is uniquely powerful features will make Process Monitor a core utility in your system troubleshooting and malware hunting toolkit.